Julian Assange, who shot to global fame after publishing colossal amounts of classified-yet-humdrum US government data, has applied for a UK trademark on his own name. The application submitted in the last week of February by the founder of the WikiLeaks, covers “public speaking services, news reporter services, journalism, publication of texts other than publicity texts, education services, and entertainment services”. 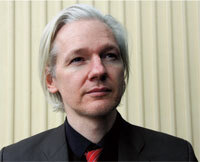 It could be granted in May, provided that, nobody contests Assange™’s trademark application. There is a chance that it might be rejected because the word “assange” has become a verb: to assange is to disappear suddenly.